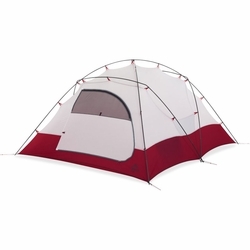 MSR Remote 3 Tent. A cavernous stronghold for three, the Remote 3 mountaineering tent provides highly livable, sanity-sparing accommodations for those spending three days or three weeks on the mountain. It features a central-support frame and nearly indestructible Easton® Syclone™ poles that allow it to defy fierce winds and heavy snow loading. Its two doors feature vents, which can be closed if things start to rage beyond the walls. Inside, a large floor plan maximizes interior space, and gear loops let you line-dry damp clothes. The large vestibule shelters weeks-worth of expedition gear. Robust Design: Unique central-support frame combines with ultra-durable Easton Syclone Poles to withstand severe conditions and heavy snow loads. Reinforced Guy-Out Points: Prevent fabric tears and keep double-wall tent well-tensioned in ferocious winds. Spacious: Larger floor plan and extra headroom create a generous interior for 3 climbers in bulky winter gear, while the large hooped vestibule with snow flaps shelters climbing equipment. Easy Setup: Color-coded pole clips for quick tent setup in any conditions. Additional Features: DuraShield™-coated fabrics and taped bathtub floor; two internal pockets; multiple reflective guy points.